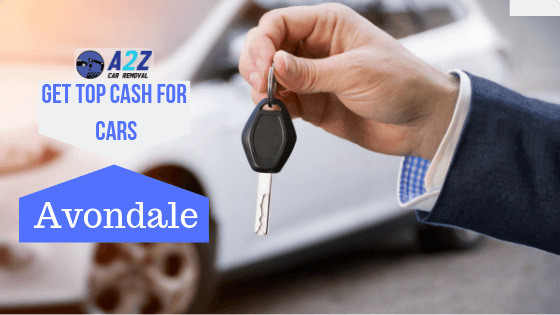 Trying to get rid of your junk car in Avondale? Worry not, you’re looking at the perfect website! We will give you the best car removal service in Avondale and we will get you rid of your car within 24 hours. We have a team of experts that analyse your car’s details over the phone once you’ve given us a call. They will then assess how much cash your car can be bought for, and will then pick your car up. These cash quotes provided to our customers is absolutely free of cost!. We offer the fastest car removal service in Avondale. Our experts will give you your free quote within 2 minutes into your phone call. They will then ask for your acceptance or denial of the cash offer that has been made to you. If you’ve accepted the quote, we will offer you a free pickup service from your premises. It’s your car, your address and definitely your call! You tell us where to pick your car up from, you tell us when, and you give us your car details. Your car will only be picked up according to the scheduled pick up time. It doesn’t matter which condition your scrap vehicle is in, we will buy it instantly. This is why we are the most reputable car wreckers in Avondale and other suburbs of Auckland. So call us now to get a free car removal done right away! Call us on 0800 114 320 or you can alternatively fill up our ‘Get a Quote’ form and wait for us to call you! We Service Throughout Auckland Regions & Surroundings.